What is your obstacle to being a Happy Muslim? Please email me and I will provide counseling and support by email, insha’Allah. hi,i am an engineering student.i am a intelligent student since my school ,almost all tthe times i was atopper in my school and clg.but as the environment is not good at top colleges in city my parents have sent me to a smaller college ,i am not satisfied about it i always feel that if i would have been given an opportunity i would have achieved a lot in my life .secondly my parents dont allow me for jobs then wat must be the aim of my education.how can i serve islam through my engineering? Thank you for your message. I hear you saying that you feel that your parents’ decisions have negatively affected your personal growth and progress in life. You are wondering how you can serve Islam with your education if your parents do not want you to get a job. These are important issues and I would need more information from you. For example, what is the reason that your parents are not allowing you to work in a job? What exactly do you dislike about attending a smaller college? I will also send you an email. 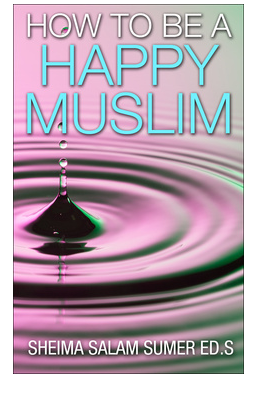 If you do not receive an email, please email me at howtobeahappymuslim@outlook.com. I am going through health problems and money problems. I feel depressed and lonely. I don’t know what I want to do with my life. Thank you for your honest comment. I just received your email today and in shaa Allah you can share your story and find a way out of your problems. sala. I just wanted to ask u about a personal matter. Assalam Alaykum, my fiance is having a very close male friend with whom she is very much emotionally attached. He has helped her through difficult times, and I dont doubt about her relationship with him. Now, whenever in our discussion, she mentions about him, I get a very insecure feeling inside me. I also have gone through very hard times and never seeked the help of a female friend for emotional support. I kept all my emotions inside me because I felt it was the right of my wife to have the key to all my emotional treasures. i too want to get married to a girl for whom I am the best and not second best. I want to remove the nail from the heel of my shoe rather than having extra layer of socks so not to feel the pain of insecurity and jealousy.. I have huge obstacle I am trying tackle right now, I have been searching for some support from an outsider just to feel abit sane not that my family havent helped, they have been great Alhamdulillah. Please do email me in sha allah, I am in great need. I need help and guidance on a number of issues. Please give me some help and advice on a number of issues. Assalamu alaikum dear sister! You are doing a very great job ; may Allah bestow u rewad! This Abdul Majid (27yr) and want to share you that I’m too much confused from past few years… plz read my mail! Going to very hard time after i broke up with my gf. She already found a man in 3-4 weeks and got married. But im stuck there 🙁 How can i accept it and move on ? If we were not meant to be together why we met and attached together ? How to be at peace with life? How to always be in a peaceful state? How do I ensure I don’t repeat a major sin I just committed, although the desire to do it is entrenched deep in my heart and excites me? How to live peaceful in life? wa alaikum as salam dear Sister. I have emailed you back. AssalamAlaikum Sister! I hope you are well. I emailed you almost a year ago regarding some problems. And I again want to start discussing about something. I think the way I have been behaving for a while are different from what I think is right or wrong. I have went through some very stressful days over the past years. Thank you for your comment. It’s very important to live/ act according to your values/ what you think is right. When we don’t live according to our values, this causes lack of inner peace. Please email me at howtobeahappymuslim@outlook.com for more discussion. Thank you so much for your encouraging words! Alhamdulillah. I have mailed you a few times before about some of my problems. Over the years I have observed and Alhamdulillah I have better understanding now. I found this article which I find very similar to my situation but I think I am getting better. I want to better deal with my problems. I want to be become better at coping. And I need this also when I am around people because that is when I lose control. How can I be positive and stay calm while putting my trust in Allah(swt)? Because I have difficulty in staying calm and patient when anything triggering happens and my mind stops working. Like, right now I came from outside and my head is aching a lot and I coudln’t really figure out what to do although I believe I am capable of dealing with such situations. (Much of my problems result in physical reaction to the triggers like looking away or really difficult in maintaining expressions. Its been happening for over a year. I have come to realize that I can’t be myself in front of some people. As a result I feel much difficulty dealing with them. For example, I shake whenever they cough or come near me. They have eventually understood this and purposely provoke these behaviors in me which I cannot control making it even more breathless and difficult for me. I hold my expressions tight but it breaks. These are people who work inside my house. They are just supposed to do their regular work but they bother about making it difficult for me. When things get very difficult for me, I sometimes reacted in pretentious manner and sometimes by shifting focus to something else. As I write this, my mind cleared up a lot and my body feels at ease. Both because you said writing is better for my mind and because I am getting to share it with someone. I feel like I almost understood why this is happening to me and why they are behaving like this. Please suggest something. My head is hurting because of this and I cannot sit relaxed inside my house. Thank you for your comment on my blog. I understood that you cannot be yourself in front of people. I am glad that writing down your feelings is helpful. My question is: how exactly do you wish you would act when they do these things? If you know how you wish to act, you can visualize this in your mind and practice acting this way. Also, are you able to just remove yourself from those people/ go to another part of the house?